Steven G. Smith. Full History: On the Meaningfulness of Shared Action. London: Bloomsbury Academic, 2017. 264 pp. A self-defeating exercise in wishful thinking, Full History is one of the strongest philosophical expressions this century of a seemingly unshakable faith in history. Ostensibly, the book reduces to the claim that everything is part of a larger, interdependent historical whole; that all human action is action shared with and made possible by others. Accordingly, “no action is fundamentally independent” as it is part of an “all-inclusive continuum of occurrences in which each occurrence is derived from prior occurrence, placing no unnecessary limit on the relevance of earlier occurrence” (pp. 1, 20). 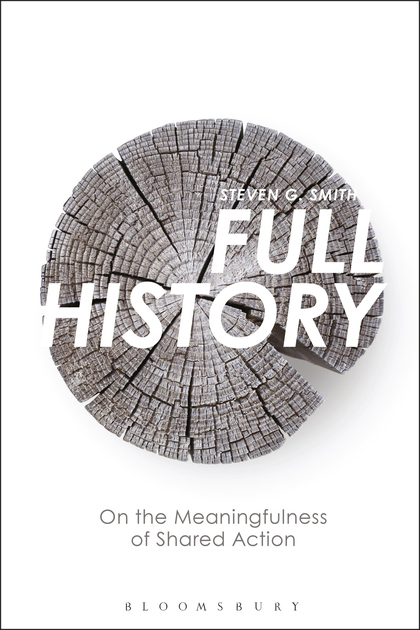 To affirm this idea of “full history” as “an unlimited field of discernment of what happened in all dimensions and at all levels and scales,” Smith finds it expedient to infer from the smallest occurrence a degree of meaningful connection with other occurrences more extensive than those imagined on the lesser scales of historical awareness typical of everyday consciousness (p. 21). To attain the “fuller historical understanding” he craves, Smith advocates historicizing to ensure that every conceivable aspect of life is enfolded into history’s “causal continuum,” since “complete scepticism and refusal [of it] would completely repress the category of history, and history is irrepressible” (pp. 86, 21, my emphasis). The fusion of self and history seems to be inevitable, even desirable. Left unmentioned, however, is the issue of how the “larger stream of occurrence” and one’s everyday actions are synchronized, what makes them compatible, or how to determine one’s precise “place” in that “stream” (p. 110). Nevertheless, it’s a strategy reflective of an allegedly indisputable “need” for more history—a need with which our culture is now suffused. If there were only sufficient quantities of historical knowledge, the thinking goes, if only all that historical data were better coordinated, one might at last understand things to a “fuller” degree. So, because the world is taken to be irreducibly historical, the apprehension of historical knowledge—perhaps even its universal unification—appears to be the surest means of comprehending it. In this regard, Smith’s thesis is nothing new or subversive. For him, the way to comprehend the historical “whole” more “fully” is—as the discourse of the humanities incessantly demands—to contextualize its pieces, to place them in a more comprehensive historical context, to enlarge the scope of historical intelligibility, to attain a “more inclusive view” (p. 5). He dutifully concedes that “the whole of history cannot be considered apart from any of its pieces” (p. 176). Still, if “unrestricted history offers an infinite field of study” “incorporating all possible content of interest and importance,” then how can the “whole” of it be competently “considered” when most of its “infinite” pieces either haven’t occurred or are irretrievable (pp. 20, 22, my emphasis)? How is the idea of an “infinite field of study,” an “unlimited field of discernment,” compatible with the full “incorporation” of its contents? The endless amplification of history, in the belief that “infinitely many more historical realizations might be had,” is a strategy impossible to adequately execute because no one can tell how to execute it adequately (pp. 18–19). Paul Valéry, The Outlook for Intelligence, trans. Denise Folliot and Jackson Mathews (Princeton, N.J., 1989), pp. 5, 23.